Smudging is the ancient ceremony of cleansing yourself and others with smoke from certain herbs. Smudging can be used for welcoming in the new day, or cleansing the body, home or workplace, but is also used on ceremonial occasions, including sweat lodges. Beautiful wild crafted white sage smudge stick with dried sunflowers. 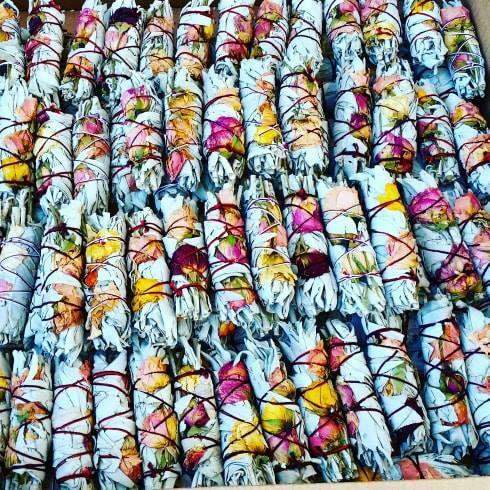 The smudge stick comes with a ..
Gorgeous wild crafted USA smudge with whole dried mini roses. Approx 10cm .. Size: 12 - 14cm Pack of 3 Wild harvested by Native American Indians. White sage is th..